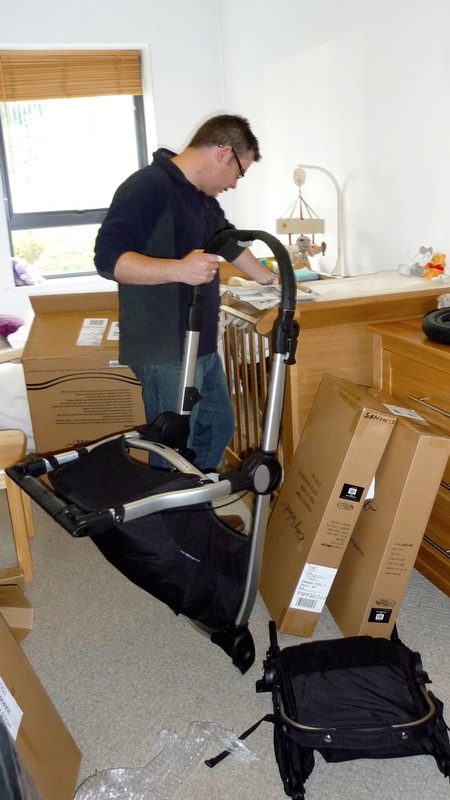 On Saturday we took delivery of our baby buggy, yet another kin’ flatpack (grrr….) 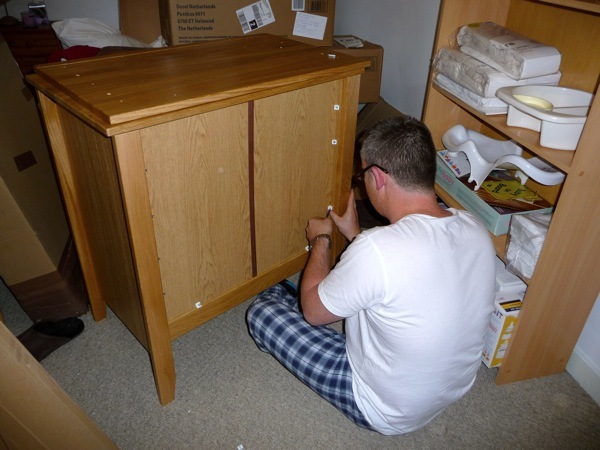 – thankfully it was less arduous to assemble than the nursery furniture. 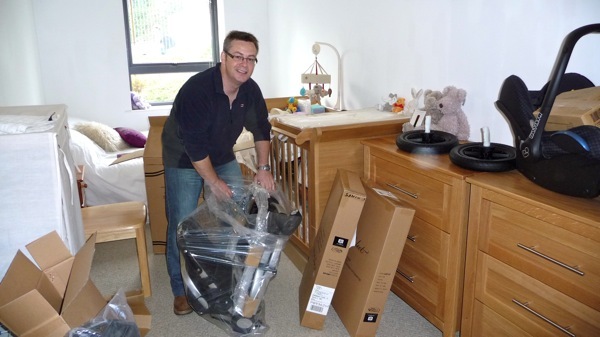 This was our last major item and we are now ready to take delivery of two new babies…bring them on Sam :). 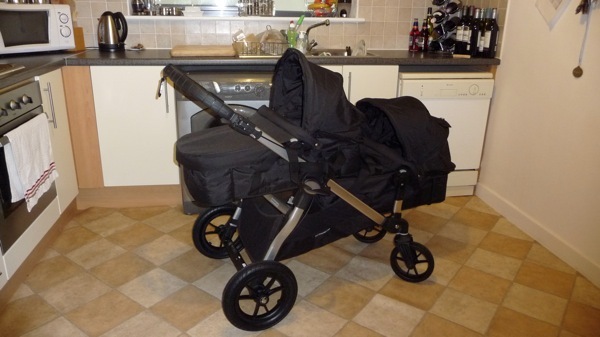 Our options were limited given we needed a system that would carry two seats and two cots. 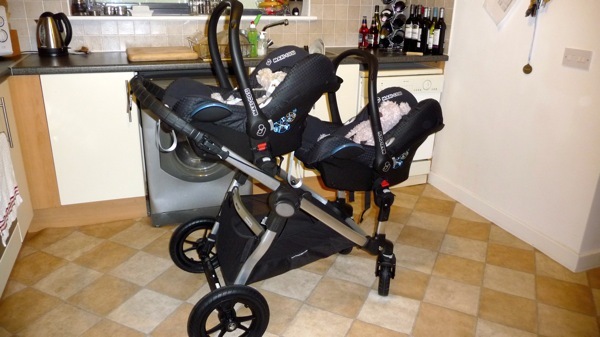 We had a side-by-side or front-an-rear option – the Multiple Births Society of Ireland recommended the front-an-rear as its easier getting it and out of doorways etc. We were worried it wouldn’t fit through our L-shaped hall but it wasn’t an issue. We did have a laugh trying it out in our apartment with our two models, Oscar and Scamp :). I had to share this with you. 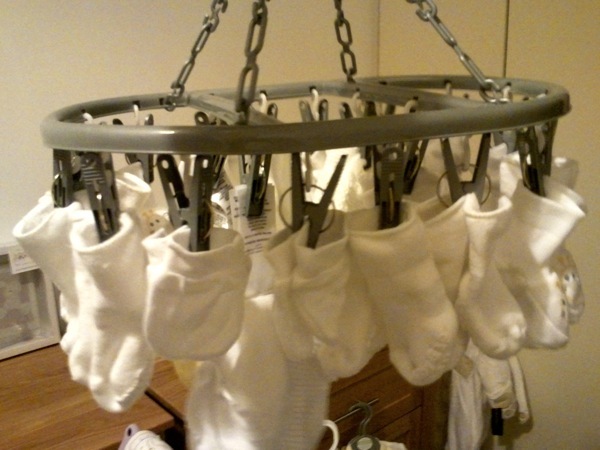 We’ve just started to wash all our baby cloths and prepare the hospital bags – only four or possibly five weeks to go. How cute are those tiny socks. 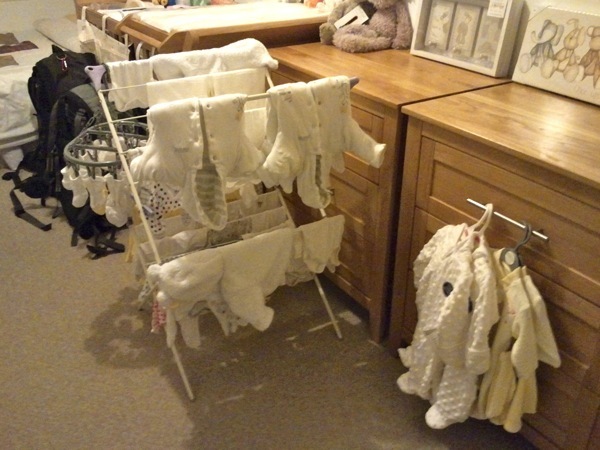 This was only one load of washing :-). In the second picture you’ll see our travel rucksacks still lingering in the background – we don’t have it in us to put them in storage. Given our current circumstance we might as well put them in the bin :-). Any expectant parent will tell you that it dosen’t really sink in that your baby(ies) are upon you until work begins on the nursery. Researching and preparing the lists of required furniture, clothing, toiletries and mandatory gadgetry takes far longer than anticipated and is more enjoyable than expected. That process started for us over three months ago. Thank god for the internet. 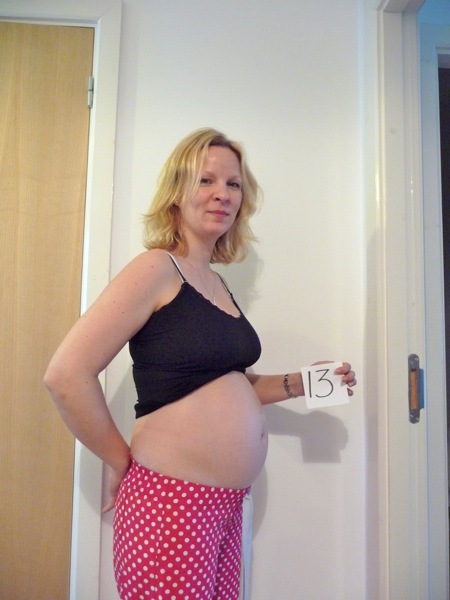 Having twins requires longer lists and a little more thought around costs versus practicality. 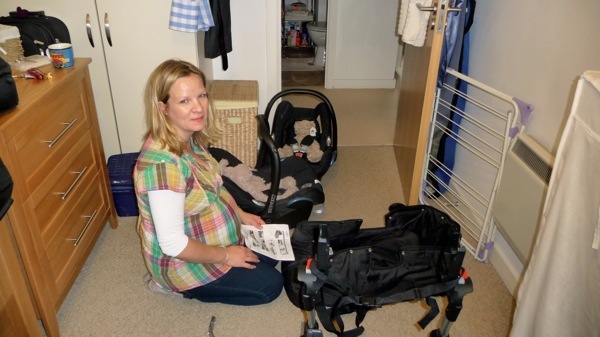 Forearmed with lists and internet comparisons we visited many of the high street baby stores. Our plan was to negotiate a discount if we were to purchase everything from our lists in one foul swoop. As expected, some stores were hungrier than others. As seasoned hagglers from our traveling days, and given the current economic climate, we walked away grinning with levels of discount we didn’t think possible – ploying the manager and attendants with chocolate muffins probably helped! We had a few weeks wait before our furniture arrived. It was on a Wednesday and our friends and old neighbours Kim and Tim were arriving from the UK for the weekend on the Friday. 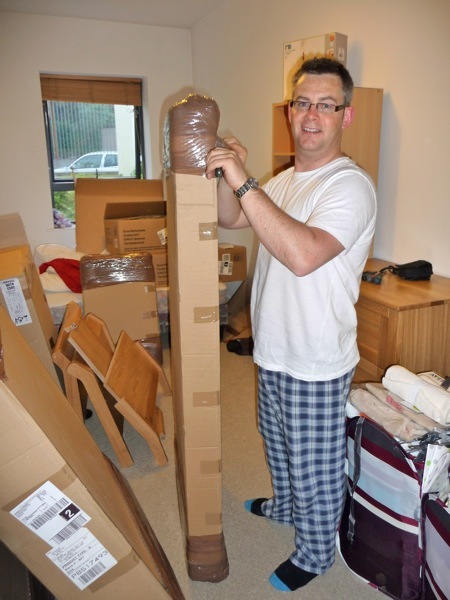 It was a bit of a rush but we managed to assemble all the flat packed boxes (grrrr…) just in time. 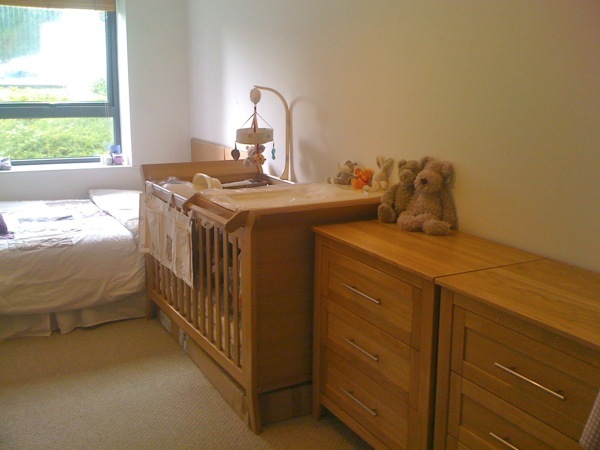 We ordered two solid oak cot beds, two chest of drawers and a cot top changer. 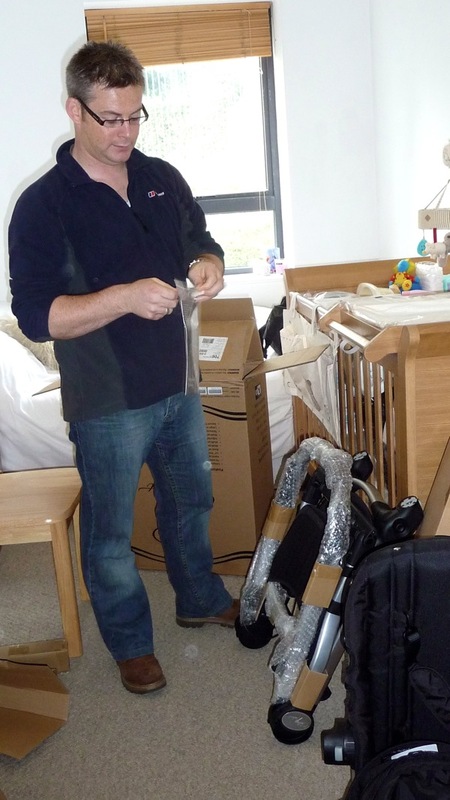 We have only assembled one cot bed for now as we plan to sleep the two in one for the first few months. 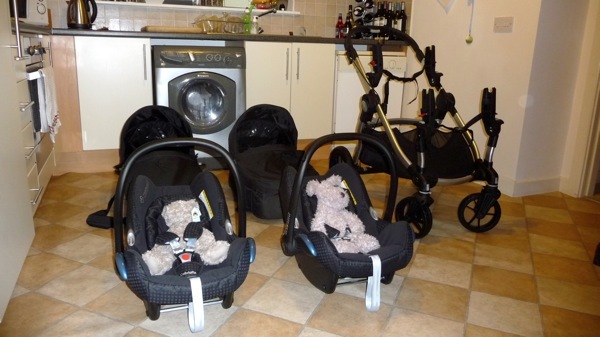 Car seats and buggy will arrive nearer the due date. We are really please with our efforts. 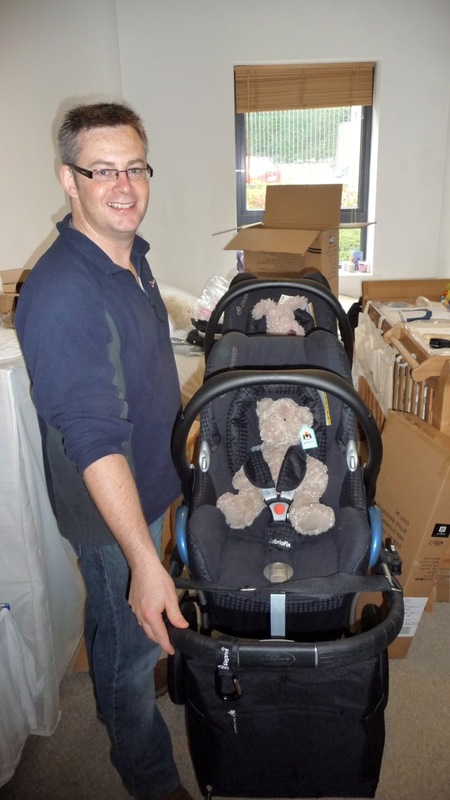 A big thank you Kim and Tim for the beautiful teddies.